A lovely dress and scifi-y boots from Graves tonight, we’re wearing Splice and Cy-Boots. Splice is the dress version of the classic Splice suit. It’s cut generously in front and black - well, sides too - and has a very smart rigged mesh skirt panel, the first we’ve seen. Aside from the clothes-layer dress (all layers plus tattoo) and gloves, you get the trademark Graves prim bits on the upper arms, plus some cool bracelets and matching collar that look like they’re made of futuristic bullets. All prim bits have a resize script and are copy, so backup before fiddling, as usual. Jackie moved to Caspervend so we got to see the new gift cards in action. They mount as a HUD item, and are pretty darn cleverly made. Good job, Casper! A good-looking outfit, with some pretty good shine highlights on the buns ;) I like the Splice straps running all around the skirt. 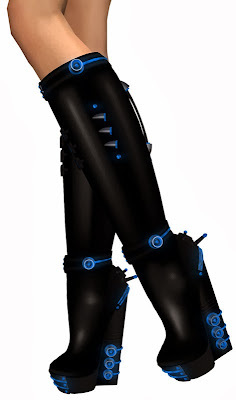 Jackie Graves has her own futuristic style, that’s why you can so easily mix and match her outfits, tonight i’m wearing her Cy-Boots, which neatly follow that tradition. I do love my blue LEDs, which is a joke between Mistress and me, so these boots were just crying out to me. The boots come with a HUD that lets you control the color of the rings, rivets and screens on the boots, i went a bit mad on the first picture to give you an idea. The HUD also lets you adjust the size of the boots with a simple plus/minus button, easy to miss but works beautifully, not that i needed much of an adjustment. The boots are copy so you can make color matched versions for all your (Graves) outfits, she even added a backup pair, just in case you really went berzerk.